Welcome to the Daguerreian Society's new Website https://www.daguerreiansociety.org. There are many features you might want to check out. -Member's Search where you can use keywords to find members and lost connections. 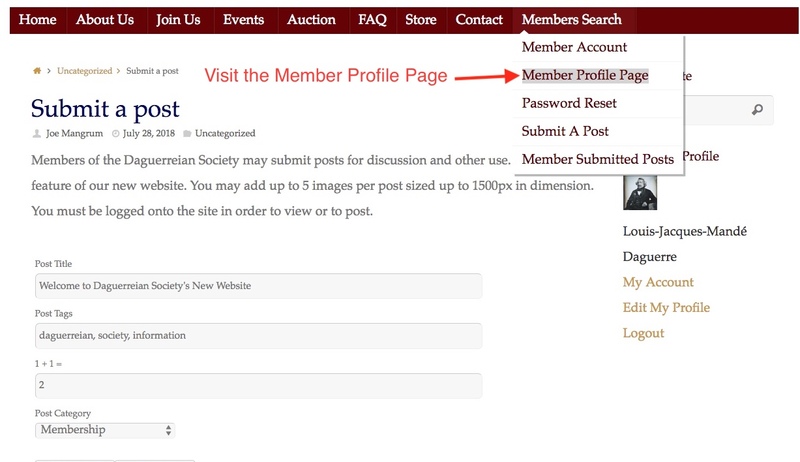 -Member admin page where you can update your account, set privacy settings, change your password. -Submit a Post This Page where you can post items of interest and get feedback etc. 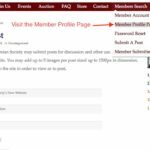 -Member Submitted Posts Where you can view the latest posts by other members and comment. 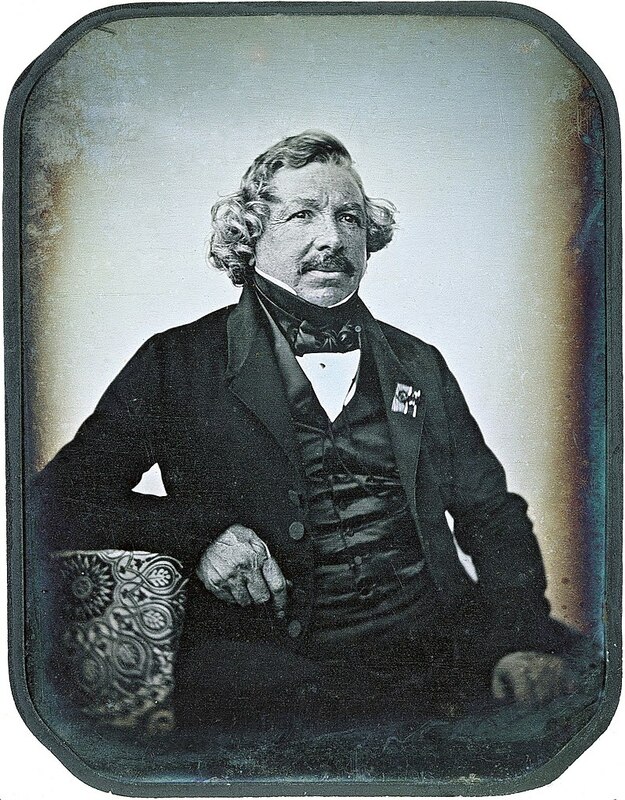 Louis Daguerre was born in Cormeilles-en-Parisis, Val-d'Oise, France. He was apprenticed in architecture, theatre design, and panoramic painting to Pierre Prévost, the first French panorama painter. Exceedingly adept at his skill of theatrical illusion, he became a celebrated designer for the theatre, and later came to invent the diorama, which opened in Paris in July 1822. In 1829, Daguerre partnered with Nicéphore Niépce, an inventor who had produced the world's first heliograph in 1822 and the oldest surviving camera photograph in 1826 or 1827. 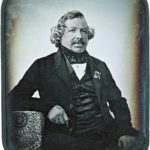 Niépce died suddenly in 1833, but Daguerre continued experimenting, and evolved the process which would subsequently be known as the daguerreotype. 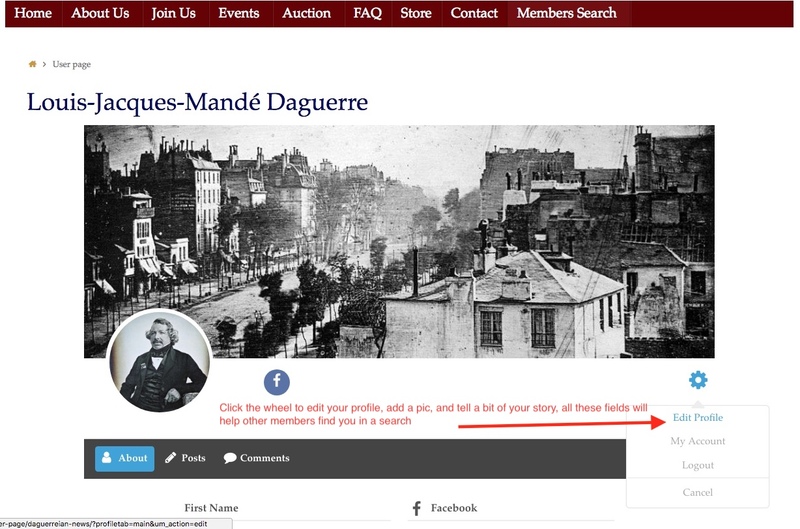 After efforts to interest private investors proved fruitless, Daguerre went public with his invention in 1839. At a joint meeting of the French Academy of Sciences and the Académie des Beaux Arts on 7 January of that year, the invention was announced and described in general terms, but all specific details were withheld. Under assurances of strict confidentiality, Daguerre explained and demonstrated the process only to the Academy's perpetual secretary François Arago, who proved to be an invaluable advocate. Members of the Academy and other select individuals were allowed to examine specimens at Daguerre's studio. The images were enthusiastically praised as nearly miraculous, and news of the daguerreotype quickly spread. Arrangements were made for Daguerre's rights to be acquired by the French Government in exchange for lifetime pensions for himself and Niépce's son Isidore; then, on 19 August 1839, the French Government presented the invention as a gift from France "free to the world", and complete working instructions were published. In 1839, he was elected to the National Academy of Design as an Honorary Academician. Daguerre died on 10 July 1851 in Bry-sur-Marne, 12 km (7 mi) from Paris. A monument marks his grave there. 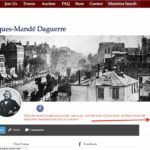 Daguerre's name is one of the 72 names inscribed on the Eiffel tower.